Chinese Technique : An Illustrated Guide To The Fundamental Techniques Of Chinese Cooking, by Ken Hom. Size: 8.5" x 11" x 1.5"
From the Dust Jacket About the book: My knowledge and love of Chinese cooking came from watching and imitating as a young apprentice in a restaurant. 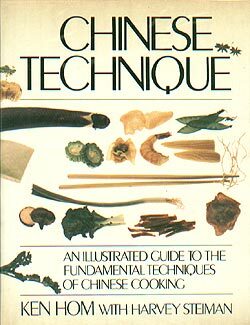 Later, as a teacher, I was struck by the fact that although many of my students had read of this or that technique described in one or more of the fine Chinese cookbooks that are available, it was only when they saw the techniques demonstrated that they finally understood. Only then would they attempt to duplicate what I had shown them. The step-by-step procedures that I presented and lectured about became the basis of my teaching for amateur and professional cooks alike. The cliche about pictures (or a demonstration) being worth over a thousand words has validity indeed, as you shall soon see. It's true that you can't fully understand Chinese cooking just by reading recipes. Surprisingly, however, the principles of this delectable cuisine are remarkably simple and easy to master if approached with patience and logic. But if you haven't quite overcome the sense of mystery that keeps many Americans from becoming Chinese gourmet cooks, this book will revolutionize your way of thinking. Chinese Technique is the first truly comprehensive book that illustrates, step-by-step, the art and skills of Chinese cooking (modeled after Jacques Pepin's La Technique). Hom demonstrates the skills that are basic to the Chinese cook skills, by the way, that can be applied to any cuisine with exceptional results. Over 100 techniques from the basics of using a cleaver to the complexities of preparing Peking Duck are fully explained and illustrated. Each technique is followed by at least one recipe that exemplifies it in use. Once the principles are learned, they can be savored in their original Chinese context or used with Western ingredients for endless variety and appeal. Chinese Technique is a book to use and to enjoy, one that will make Chinese cooking less awesome and more accessible, and atnturous, more satisfying and more fun. About the author: Ken Hom, according to Craig Claiborne of The New York Times, is 'one of the best-known Chinese cooking school teachers on the West Coast." He is a highly respected instructor with an international following. Besides teaching in his own school, he is also a member of the faculty of the California Culinary Academy (a school for professional chefs) and will be teaching cooking classes in Hong Kong. Mr. Horn has frequently been a radio and television guest and gives demonstrations throughout the country. Born in 1949 in Tucson, Arizona, Mr. Hom, who speaks several languages, studied medieval art history and was formerly a professional photographer and free-lance television producer. He has traveled extensively and has lived in Europe, where he studied film. A documentary he produced on modem Chinese history was nominated for an Emmy in 1976. Mr. Hom is an inventive chef who has gained the attention of the press and the respect of some of the world's foremost food authorities, among them James Beard, Julia Child, and Jacques Pepin. About the co-author: Harvey Steiman is a respected food and wine editor who writes a column for the San Francisco Examiner. He is the author of Great Recipes from San Francisco and Guide to Restaurants of Greater Miami. Mr. Steiman has been a writer and editor for newspapers in Los Angeles and Miami. Willie Kee is a newsreel cameraman with KTVU television in Oakland, California. He is a prize-winning photographer whose credits include seven Emmy Awards.